This is the Church of the Ascension, but it’s really a mosque (but only sort of) and that points out the tricky situation that greets one both politically and spiritually in this land. 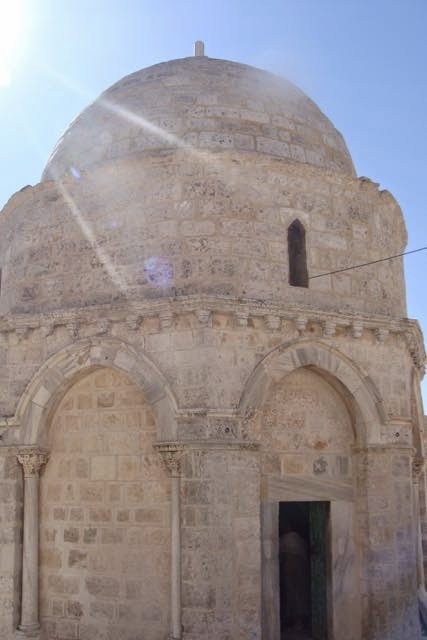 There is a stone in the church with the “footprint” of Jesus, left as he returned to higher realms. There is an aspect of this that I find disconcerting – the flight to a realism that seems to dull the sense of the mystery that is the Word made flesh. 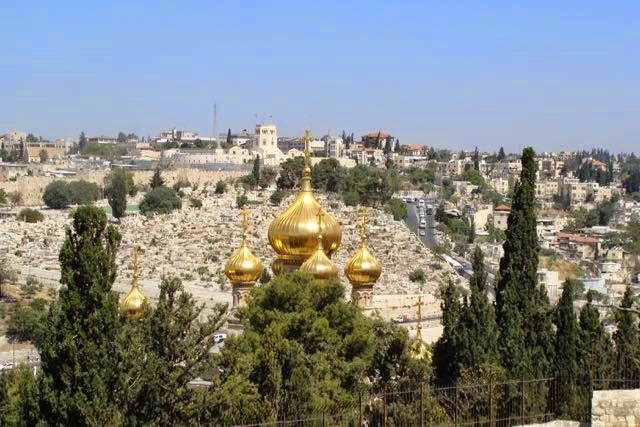 So we make our way down the Mount of Olives: The Church of the Pater Noster, then Dominus Flevit, passing by the fabulous Russian Orthodox Church (it never seems to be open). Next to the Garden of Gethsemane we spend a little time at the Church of All Nations, and then bus over to Peter in Gallicantu. Each one seems a remove from the genuine, an effort at providing a place for each event, that doesn’t seem to reach my own heart of faith. Perhaps I am being unkind. These feelings that I am having about the fragility of belief perhaps prepares me for the streets of Jerusalem. 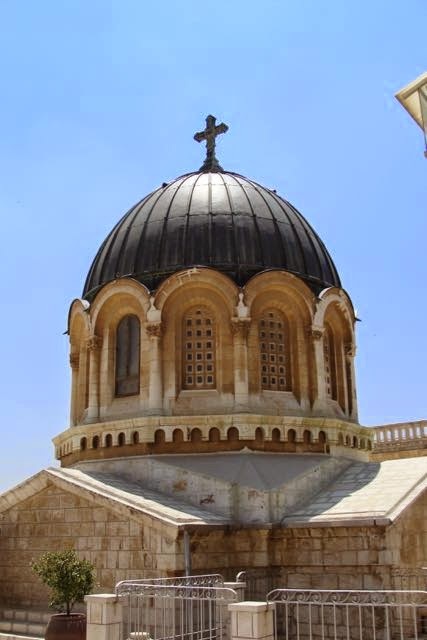 We are scheduled to have lunch at the Convent of Ecce Homo, but the walk there from Herod’s gate through the Muslim Quarter becomes a lesson in the reality of Jerusalem. A score of young boys around seven to ten years of age come running towards us shouting, “Allahu Akbar”, and subsequent boys give us the finger, one shoving a woman in our group - there are feints, and there is serious anger. We have raised a new generation to hate us (Who the “we” is in this sentence is greater than any one religion, country, or political system. Here in the city of peace, we see that the whole of society is, as one of our number said, “skating on thin ice.” Lunch, however, was good – pork! 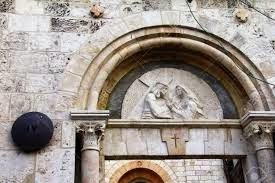 From there we begin the Stations of the Cross along the Via Dolorosa. We are carrying a large cross, and are passed-by by all kinds of people. For those who live here it is probably an ordinary part of life. I am aware that we “stand out” and are making a statement – and some of us wonder what the value of that statement might be. Who are we engaging? Who are we putting off? The final stations are said on the roof of the Holy Sepulcher where we are allowed to walk through an Ethiopian Monastery. A banner invites us to pray for Ethiopian and Coptic martyrs. It adds context to our journey and our praying of the stations. 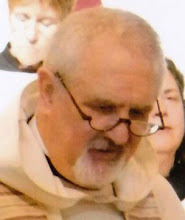 At Erlöser Kirche – The Lutheran Church of the Redeemer, we have a con-celebrated mass (a tradition amongst the Society of Catholic Priests chapters and provinces). I am privileged to lead the intercessions. The space is simple but engaging – I like it a great deal. 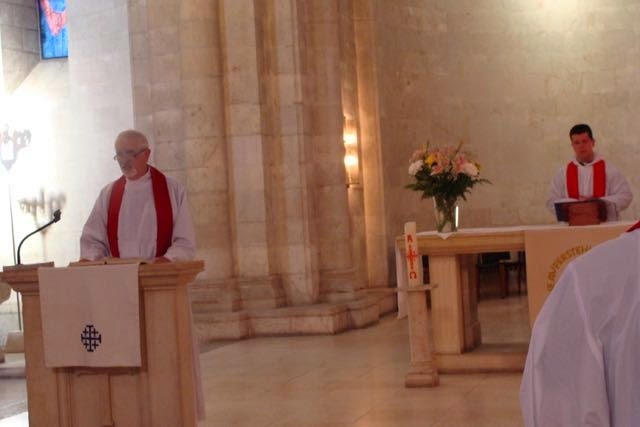 It is good for us to be in a Lutheran environment, and there is conversation about how the society needs to have a fuller engagement with churches with whom the Communion is in communion. 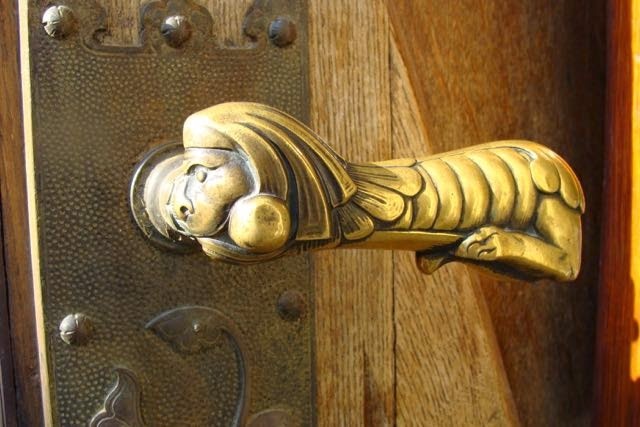 As we leave the church, Arthur points out the door handles – examples of the uncanny abilities that Germans have with ecclesiastical metalwork. We grasp at a lion that holds the handle in his maw. I wonder who the lion is, and if we all indeed are in the lion’s mouth, and how we will get out. I used to think that children were the answer – but now I’m wondering if that’s even true anymore.